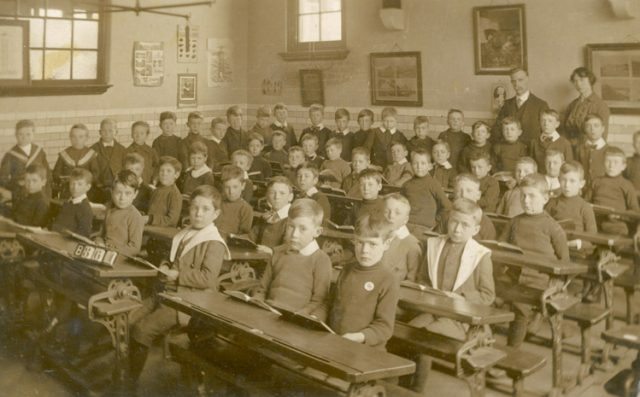 The image above, taken from a Victorian classroom, paints a very clear picture that whilst many aspects of education are unrecognisable from those of generations that have gone before, one aspect remains a permanent picture: rows of desks. I have a couple of theories about this (and to be clear, these are just theories; I have no evidence). The first is that part of me believes that certain students are often reluctant to answer a question that they are not 100% sure of, when they know there is a whole class of students sat behind them. Essentially they are thinking, ‘what is going on behind my back as I’m saying what might be a silly answer?’ (For more on rethinking ‘wrong answers’ see the post on virtuous errors). Secondly, I can’t help but think that all students facing the front, where the only pair of eyes they can actually see is the teacher only serves to reiterate the point that the teacher is the only expert in the room. This certainly doesn’t help when we want students to think for themselves and challenge ideas. Thirdly, I am mindful that it creates an awkward barrier to trying to have a discussion with multiple participants feeding of each other’s ideas. If they are all facing the front then the direction of ‘speech travel’ can only go one way – straight to the teacher – and not around the room. What springs to mind is a recent conversation I had with Stuart McTiernan. After discussing the sentiment of the above quote he said (and I’m paraphrasing here) ‘What use is it, if students come to class, but don’t use the unique resources of the classroom environment – the other students?’ And I think that he hit the nail on the head. The teacher is but one resource, there are 24 others waiting to be utilised. Previous articleAre Kahoot quizzes just a bit of fun?